The Flagstaff Convention and Visitors Bureau (CVB) was honored by the Destination Marketing Association of the West (DMA West) for their work developing and implementing the #VisitCool campaign and Flagstaff Cool Zone. The CVB was presented as a Best Idea Award recipient this past Thursday, September 23rd at their Annual Marketing Summit in Ogden, Utah. Four destination marketing organizations received achievement awards in the recent competition. Sponsored by DMA West, the annual Best Idea Program showcases innovative projects and creative marketing strategies as submitted by members. Winners are selected by a Board-appointed Task Force with winners presenting their best ideas during the annual summit. The CVB launched their newest initiative, #VisitCool over the July 3-4, 2015 holiday weekend. The marketing campaign focuses on the climate difference between Flagstaff and its top inbound market – the Phoenix-metro area. During the launch of the year-long campaign, frozen interactive features were placed throughout the Valley as high traffic, public areas including malls, professional sporting events and Fourth of July celebrations. The features included cruiser bikes, trekking poles, a snowboard, telescope and Northern Arizona University (NAU) gear. Each interactive feature was supported with Flagstaff brand ambassadors, talking about travel to Flagstaff and collecting email data through an enter-to-win program. The three bikes that were encased in ice, along with a trip to Flagstaff and telescope were the winning prizes for the contest. Over the two-day launch nearly 100,000 people were reached. A special website, www.visitcool.com, was developed to highlight program partners and drive people to Flagstaff deals and events. The overall campaign was supported with online video advertising, social media advertising and a strong media presence. Headlines such as “frozen hiker” and “epic fourth of July freeze” were used to generate additional publicity of the locations. In addition to the holiday launch, the CVB wrapped an outdoor courtyard in the Legends Entertainment District, dubbed the Flagstaff Cool Zone. This is the second iteration of the Flagstaff Cool Zone and the new wrap was highlighted with a relaunch activation this past August 7th featuring two frozen trekking poles as a photo op. #VisitCool will continue through next June with regional activations, online advertising, email marketing campaign along with social and traditional media efforts, increasing awareness of Flagstaff and its seasonal climate. The mission of the CVB is to develop, promotion and maintain Flagstaff as a premier year-round visitor destination with professional visitor services that benefits the community economically, socially and environmentally. For more information visit www.flagstaffarizona.org or email Joanne Hudson; jhudson@flagstaffaz.gov. 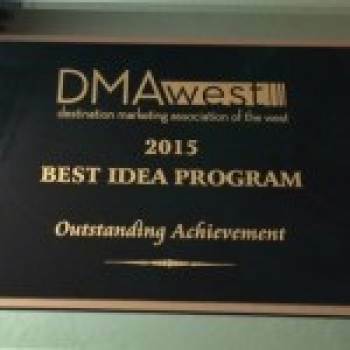 For more information regarding DMA West and their Best Ideas program visit dmawest.org.